The Pilates Roll up is a fantastic movement for strengthening your core, abs, hip flexors and more importantly mobilising your spinal column. 2. your lower back is too tight. Here's how you fix that. Start in the seated position below. Sit tall, as close to neutral spine as posible. Ensure you are equal on each of the sitting bones. Your legs should be bent with both feet flat on the floor. Both arms should be by your side with your palms facing upwards. Centre yourself throughout the movement. Inhale to prepare and on the exhale tilt your pelvis, (see below) as you roll off your sitting bones, rounding your spine into a C curve. You will be aiming to lay your sacrum towards the mat. Keep your shoulder blades down your back throughout the movement. Draw your chin towards your chest so that your cervical spine (neck) is long. Imagine a tennis ball trapped between your chin and upper chest. Inhale to return to the seated position and repeat the C curve movement on the next exhale. Your goal is to go a little lower with each cycle. But you should never lose your core contraction or quality of movement just to increase the range of movement. Keep your heels on the floor throughout the movement. Your toes might lift off the floor if your don't have a good ankle point. Perform up to 10 quality cycles. The focus is to strengthen your weak muscles and to mobilise your tight areas. Be patient as you work on this level for a time. As you get more mobile you will also get stronger. You will be able to go closer to the floor over time. 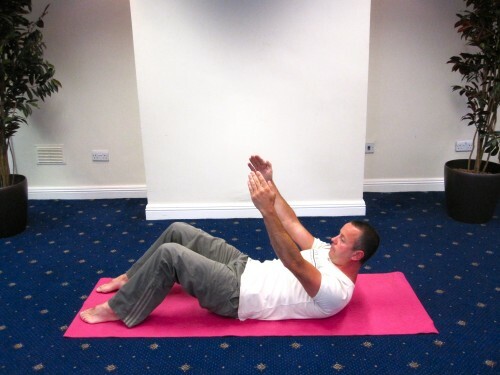 Once the range increases, the movement becomes more global, using your abdominals more. So to progress, inhale to prepare and on the exhale repeat the sequence above, but go all the way down to the floor. You should aim to lay your spine down one vertebrae at a time, from tail bone, to sacrum to L5, L4, L3, L2, L1 etc. Last onto the floor will be your head. Here you will return to neutral spine. Peel your spine off the ground with control, back to the seated position. Inhale as you return to seated neutral then repeat the whole sequence for up to 10 quality cycles.